My recent podcast with the Michelle McGlade Show! 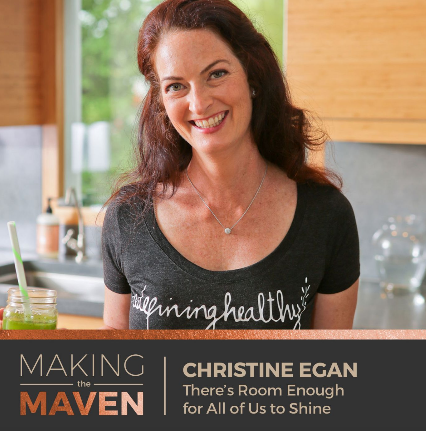 There’s Room Enough for All of Us to Shine: I was recently featured on a podcast on the Michelle McGlade show and believe me I absolutely loved every second of my chat. *Who is Christine Egan? She’s a mom, wife to her high school sweetheart, and a cancer survivor. *It was such a shock to Christine when she found out she had breast cancer because she was the healthiest girl in the room. *Christine used a combination of both traditional and alternative medicine. *Christine’s book, The Healthy Girl’s Guide to Breast Cancer, was written two years ago. *What has happened to Christine and her book since then? *Christine did have some fears that she was going to be burned at the stake for her alternative choice in medicine, for not putting her children first. *What does Christine’s business look like today? *The products you put on your body can be toxic to you. Christine found out after her diagnosis that the lotion she was using for the last 20 years had harmful ingredients in it. *A reader, who was also a makeup artist working for a cancer-related non-profit, felt sick that she was using these harmful makeup products on women fighting cancer. She asked Christine for her help to create healthy, non-toxic products. *Fast forward to today, Christine is about to launch her makeup product line, Life On Mars. *What’s Christine putting on her skin nowadays? Coconut oil! *Despite being in crunch mode to release the Life On Mars website, Christine still tells her team to practice self-care and to close that laptop by 4pm. *What’s the story behind the Life On Mars name? *What advice does Christine have for those struggling to get their business online? *It’s important to not get sucked down a rabbit hole when you see other people succeeding. Stop! There’s room enough for all of us. *What has Christine learned about business? Self-care has to come first. *Best piece of life advice? Have fun! Flip those stories in your head. *Look out for Christine’s audio book! Helpful Tips To A Healthier YOU! It’s been a weird few months for me. Looking for ways to warm up on the inside?